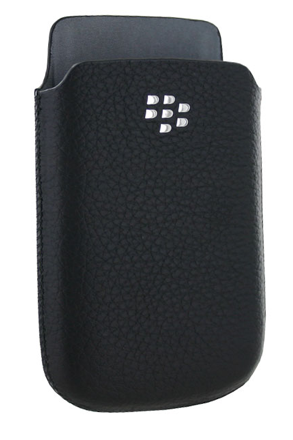 The BlackBerry Leather Pocket Pouch is a great mix of style and protection. Contest: Leave a comment for your chance to win! Pretty much every BlackBerry user has a case of some sort. Be it a skin case or hard case there is usually a reason behind it. Some choose their case for style, while others need protection. Depending on your job and your needs there is a case that will be fit for you. Maybe Barak Obama could use one of these guys if his holster doesn't work out. If you can't decide on what you like or prefer that "naked" look, a better bet may be a BlackBerry Leather Pocket Pouch. With the pocket pouch your device stays protected when not in use, but is at the ready when you need it. With its solid leather design and no clip, its sturdy yet sleek. The pouch can fit in a purse or pocket with ease and even has a proximity magnet to put your device to sleep when it's not in use. There is a full line of pouches available for all devices so be sure to check them out today. Keep reading for your chance to win one for your device! To enter to win a BlackBerry Leather Pocket Pouch for your device, simply leave a comment to this blog post. Contest ends this Sunday night at Midnight PST. Please, just one entry per person. That's it for this week's roundup! We hope you enjoyed it! If you come across accessories you'd like to see featured in an upcoming roundup, please send us an email to blackberryaccessories @ crackberry.com.